Today, NsromaMedia.Com takes a look at the women who have alleged come into his life, knowing how reckless he is sometimes. This is not a secret anymore but worth knowing. Adwoa has 2 kids with the maverick MP and according to her, Ken is a loving father. She has also dismissed claims that Hon. Agyepong is a violent person, who subjected her to abuse while they were together, adding that the only reason their relationship could not survive was the fact that they had competing goals and visions. “You’ve gone into relationships and you realize things don’t work out, so its with everybody. I’just like anybody…you go into something and probably as time goes on you don’t see it the way you want it, probably you’d want to move on. Kennedy Agyapong is married to Stella Wilson Agyapong, a woman he loves dearly and has been with in thick in thin. In 2012, Economic and Organised Crime Office (EOCO) invited them over some multi-million dollar contracts awarded him and his wife by the Ministry of Energy (MOE) during ex-president Kufuor’s regime. Mr. Agyapong stood by her till they both were discharged. You know that in November 2014, she was busted with for 12 Kg of cocaine in the UK, what you may not know is that she may have slept with Kennedy Agyapong. 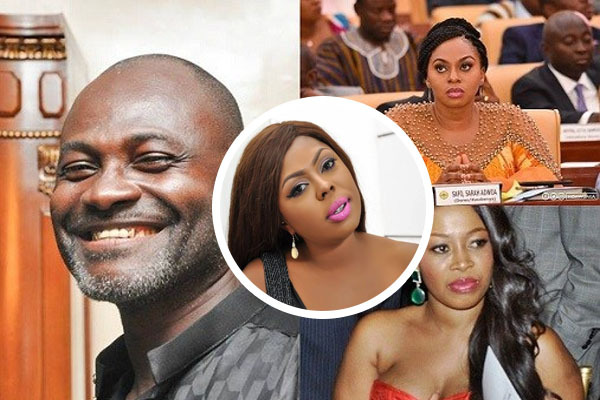 NDC activist and Editor of the Al Hajj, Alhaji Bature and Kennedy Agyapong has alleged that the British intelligence services including the MI5 and MI6 had directed their investigative radar on Kennedy Ohene Agyapong over his alleged involvement in the drug case of Nayele Ametefeh. The publication also alleged that Ken Agyapong had children with Nayele Ametefeh. Of course, we can not independently confirm the allegation but it is worth noting that several other reports have alleged that Ken either wanted the lady but failed or had kids with her. We know for sure that the lady has 2kids though.